This explains how Germain Dionne and Lucie Roberge's mariage record celebrated somewhere on the Tobique is to be found in the St. Bruno Parish register and signed by the Fr. Michael Meloy on July 22, 1856. 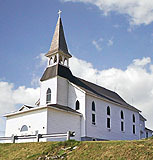 The Saint Basile Parish took charge of the Tobique and Missions from 1860-1868. Father J. J. O'Leary from Grand Falls took over from 1868 to 1886. The first priest to reside at one of the Tobique Missions was Fr. Martin O'Brien from October 1, 1886 to August 15, 1887. From 1903-1904 the Eudists fathers took over the Missions where we find the first pastor for this small parish of St. Thomas, Father Aimé Morin, C.J.M. Father Morin was at that time superior of the Eudist Fathers and resided in Rogersville. At the end of August in 1903, he took charge of the Tobique Missions. In 1904 Father Olivier de Fer de la Motte, C.J.M. took his place until 1906 when the Rt. Fr. Frederick C. Ryan was appointed pastor. Saint Thomas Aquinas celebrated its 90th anniversary on September 18, 1994 with Bishop François Thibodeau, C.J.M. Our history has deep roots within the Society of the Eudist Priests.